Carnauba Wax has long been the choice to enthusiasts and professionals who desire reflections that appear to dance under the paint with incredible depth. Carnauba wax is one of the hardest natural occurring waxes in nature. The result is serious protection for your ride. Carnauba wax is not quite as easy to apply as modern synthetic paint sealants, nor does it last quite as long. But when you desire the ultimate in depth of shine and a wet paint finish, there is no other choice. Carnauba wax grows on the fawns of the Copernicia prunifera, or carnauba palm. The Copernicia prunifera is a tree that is native to northeastern Brazil. Carnauba is excreted by the tree to protect its delicate fawns from rain and sunlight. Carnauba wax, in its natural form, ranges from a dark brown to pale yellow dependent on age and purity. Premium grade carnauba, known as #1 Yellow, is used for car waxes because it offers the highest levels of gloss with minimal clouding of reflections. 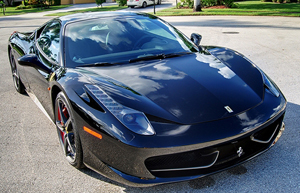 Blackfire Midnight Sun Carnauba Paste Wax creates a deep, wet gloss that shimmers like water on this black Ferrari 458 Italia. When carnauba wax is exposed to water it swells. This seals the surface it is applied to and creates an extreme beading effect that causes water form into tiny droplets and run from the surface. Carnauba wax is also highly resistant to UV rays from the sun. The hard, shell-like finish created by carnauba wax resists damage from bug remains, bird bombs, and environmental fall out. In fact carnauba wax is so hard that in its natural state it is comparable to concrete! Car waxes that feature carnauba wax are not the same! Carnauba wax is so hard that it must be blended with other ingredients in order to make it applicable to paint. These ingredients car vary wildly, from other waxes, to combinations of solvents, oils, and sometimes extremely rare and expensive extracts. Some waxes are blended with the same high-quality polymer ingredients found in synthetic paint sealants. Premium grade carnauba waxes, which differ from less expensive, store-priced carnauba waxes, usually feature highest quality ingredients. These ingredients can be difficult to work with and expensive. This requires that the waxes are hand poured to exact measurements, and hand cooked in very specific processes. 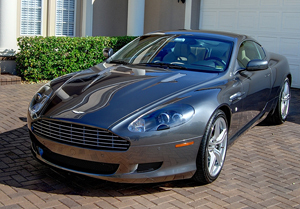 Pinnacle Signature Series II creates a reflective, high-gloss finish on lighter colored vehicles, such as this silver Aston Martin. Even carnauba wax itself isn't the same. After the wax is beaten off the fawns of the Copernicia prunifera it is graded on age and color. Most car waxes use Brazilian #1 grade yellow, this is the purest natural form. However, the wax can be purified and refined by several methods, including filtration, centrifugation, and bleaching. The purification process can be very lengthy. The highest grades of purified carnauba wax are almost pure white in color and often called �Ivory Carnauba Wax.� When this ultra-pure carnauba is blended in the methods suggested in the preceding paragraph the result is a premium car wax that can take several days to make, but rewards its user the ultimate in depth of shine and shimmering gloss. When it comes to selecting a carnauba wax there is no wrong or right answer. Each wax will exhibit different characteristics depending on the purity of the wax, the ingredients blended into it, and the precision required to cook it. Carnauba waxes will tend to create reflections that appear deeper into the paint, known as depth. They will impart wet-look shine, known as 'jetting' that makes reflections shimmer across the surface. Premium grade carnauba waxes take the look, feels, and experience to high level. If you desire the deepest, wettest, most three dimensional shine from your paint, look no at BlackFireWax.com's amazing selection of carnauba based waxes and premium grade carnauba waxes.